One of our most respected essayists, Wendell Berry, once wrote: "products are expressions of who we are." 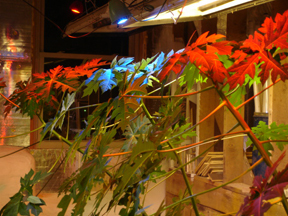 At Inn Serendipity and in our life, we are aspiring to celebrate creativity, imagination and the arts as well as feature products or services which build community, foster bioregionalism, close the recycling loop, reduce our impacts on the environment, and promote fair trade, among other factors. To consume remains necessary for our survival. In nature, everything is someone else's lunch. Where humankind has gone too far for the sake of "progress" and "growth" is how, what, when and where we consume -- and to such excess. We are not what we own. But for what we do own, it's our intention to try and have it authentically reflect our values. While we're not hugely supportive of the expanding global ecomony, we remain steadfast in our belief that commerce considering the triple bottom line (society, ecology, economy) can, and does, acheive a measure of success that goes beyond financial balance sheets. Below are some products which might be of interest to our visitors, guests, and fellow travelers in this "good life" journey. 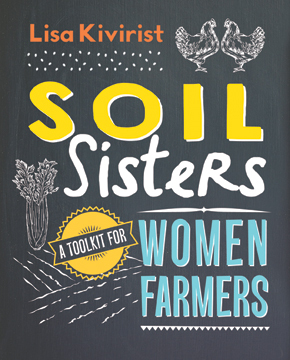 Soil Sisters, by Lisa Kivirist. The first collaborative and comprehensive start-up guide to support the record-breaking number women wanting to start farms, Soil Sisters: A Toolkit for Women Farmers provides the how-to blueprint for females dreaming of bringing their agriculture business vision to life. Soil Sisters uniquely synthesizes needed information and advice from seasoned women farmers committed to sustainable agriculture to catalyze and champion female farmer entrepreneurs. Get or give a copy (signed, if you'd like), ordered through Inn Serendipity for a special 32-percent discount off the list price with the Inn Serendipity Book Order Form. 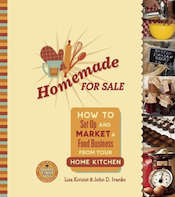 Homemade for Sale, by Lisa Kivirist and John Ivanko. Start a food business from your home kitchen. This book covers it all, from recipe testing to marketing, organizing the kitchen to expanding your operations. Get or give a copy (signed, if you'd like), ordered through Inn Serendipity for a special 34-percent discount off the list price with the Inn Serendipity Book Order Form. 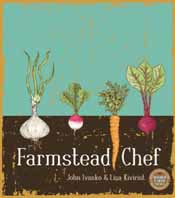 Farmstead Chef, by Lisa Kivirist and John Ivanko. With recipes and stories to nourish and inspire, Farmstead Chef transforms traditional farmstead cooking skills for the modern kitchen gardener, urban homesteader and homestead cook in all of us. Get or give a copy (signed, if you'd like), ordered through Inn Serendipity for a special 22-percent discount off the list price with the Inn Serendipity Book Order Form. Or download an Kindle of Farmstead Chef from Amazon. 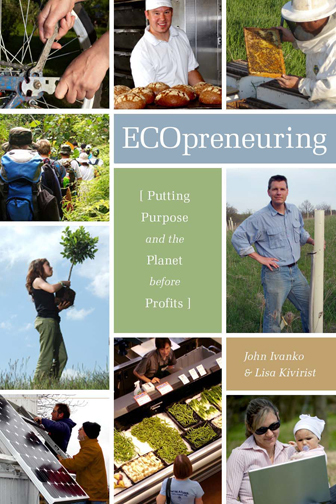 ECOpreneuring: Putting Purpose and the Planet before Profits, by Lisa Kivirist and John Ivanko. Part small business manifesto, part personal finance primer, the award-winning ECOpreneuring is essential reading for small business owners, prospective entrepreneurs, social entrepreneurs starting non-profit organizations and anyone who dreams of a livelihood based on independence, creativity, passion and a commitment to green practices and sustainability (or if you just want to get the banks out of your life). Invest in you, your dreams, your vision. Get or give a copy (signed, if you'd like), ordered through Inn Serendipity for a special 22-percent discount off the list price with the Inn Serendipity Book Order Form.Or download an Kindle of ECOpreneuring from Amazon. 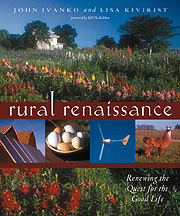 Rural Renaissance: Renewing the Quest for the Good Life, by Lisa Kivirist and John Ivanko, is a sustainable living guide addressing food systems, energy systems, living systems and livelihood (financial systems). 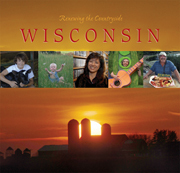 Get or give a copy (signed, if you'd like), ordered through Inn Serendipity with the Inn Serendipity Book Order Form. Or download an Kindle of Rural Renaissance from Amazon. Edible Earth: Savoring the Good Life with Vegetarian Recipes from Inn Serendipity, by Lisa Kivirist and John Ivanko with Liam Kivirist. A fresh, seasonal and sustainable cookbook showcasing the taste, nutrition and variety of vegetarian cuisine, Edible Earth can be ordered through Inn Serendipity for $10 (22 percent discount off the list price) with the Inn Serendipity Book Order Form or Inn Serendipity Greenhouse Order Form. John's children's photobooks from Charlesbridge Publishers and Global Fund for Children Books can be ordered (and signed by John) using our Inn Serendipity Book Order Form. Or you can order some of the books online, processed through the Inn Serendipity Marketplace on Square Up. Among the award-winning books co-authored by John Ivanko and Maya Ajmera include: To Be a Kid, To Be an Artist, Back to School, Come Out and Play, Animal Friends, and Be My Neighbor. His photography has also been used in Children from Australia to Zimbabwe, Extraordinary Girls, and Let the Games Begin. For hard-to-find super-energy efficient enLux LED lighting for greenhouses, sustainable agriculture products, or some of our rather large garlic, we're offering a few of the items we use ourselves in our Greenhouse & Garden on-line store. Co-op America's National Green PagesBy far the most comprehensive listing of products and services that come from businesses that are socially and environmentally responsible. These businesses adopt principles, policies, and practices that improve the quality of life for their customers, employees, communities, and the planet. Inn Serendipity's artisan-made mugs by Elk Fall Pottery can be ordered directly from Inn Serendipity; $19.95/mug, plus $5 shipping and handling.